Was born in the state of Ohio, January 5, 1840, and departed this life at his daughter-in-law, Mrs. J.F. Lawhead Feb. 18, 1920, aged 80 years, 1 month and 13 days. He was united in marriage to Martha Burch, near Bloomfield, Ind. To this union were born three children. His wife and three children preceded him in death. He was again married to Margaret Rea, near Bloomfield, Ind. To this union were born seven children. The wife and four children preceeded him in death a number of years ago. He united with the M.P. church at York, Ill., some thirty years ago and lived a faithful Christian to the end. He leaves two daughters and one son, one step daughter and one step son, a number of grandchildren and eighteen great, grand children to mourn his departure. He had been a sufferer since N [?] But bore his suffering with patience always trusting in his blessed Savior. Only last Sunday he told the relatives and friends that “he wanted to go home to Heaven if it was the will of God.” Thus reconciled with all men and with his God he passed over the mystic river and is now at rest in the land that is fairer than days. May his mantle fall upon another and his good work go for others. The funeral service took place at U.B. church, Robinson, Ill. Rev. W. H. Duncan was in charge and interment took place at Hutsonville cemetery. -Newspaper Unknown, likely published in Hutsonville or Robinson, Illinois, 1920. James Henry Lawhead was the second known son and child of Joseph and Cassandria (Harding) Lawhead. He was likely born in Marietta, Washington County, Ohio as reported on his death certificate. The family migrated at least twice during his childhood. 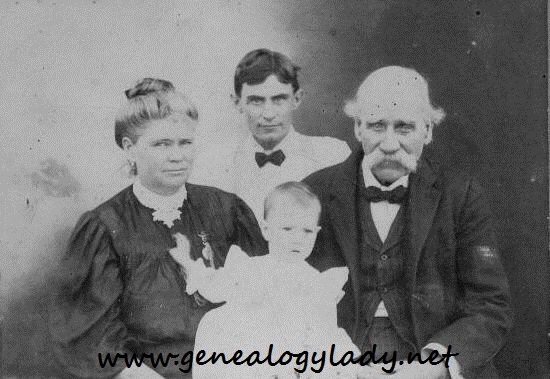 The census records the family living in Guernsey, Ohio in 1850, and then moving onto Greene County, Indiana by 1860. As a young man, James worked as a farm laborer in nearby Lawrence county, Indiana and was enumerated a second time. James married first Martha (Lafoon) Burch on 3 November 1861, Greene County, Indiana. They were the parents of three children: James Francis, Margarett A. and a third unknown child (presumably an infant which died young). At the time of their marriage, Martha was a widow with three children: Paris Burch, Ortha E. Burch and Ruth Burch. It is likely that this marriage ended in divorce. James was married again in 1868, and Martha was still living in 1870. James married second Margaret A. Rea, the daughter of George and Sarah (Jewell) Rea, on 5 December 1868 in Greene County, Indiana. They were the parents of seven children: Jasper R., Emily H. “Emma” and Minerva [twins], Saphrone, Parey, Casan and Joseph. The last four all died as infants. James and Margaret did not remain in Greene County, but moved to Crawford County, Illinois soon after their marriage. Sometime between 1900 and 1910, James and Margaret moved to Peach Orchard, Arkansas for a while. Their son Jasper had settled there. After Margaret’s death, James married for a third time in Arkansas, a widow named Cora Perkins, on 5 December 1908. James later returned to Crawford County where he died in the home of his daughter-in-law, Belle Lawhead. Even though James’ obituary states the he was buried in Hutsonville Cemetery, no grave has been found. Illinois Department of Public Health, death certificate no. 24333, James Henry Lawhead (1920); Division of Vital Statistics, Springfield. 1850 U.S. Census, Guernsey County, Ohio, population schedule, Seneca Township, p. 474 (penned), dwelling 3045, family 3067, Joseph Lawhead: NARA microfilm publication M432, roll 684. 1860 U.S. Census, Greene County, Indiana, population schedule, Center township, P.O. Jonesborough, p. 75 (penned), dwelling 530, family 530, Joseph Lawhead; NARA microfilm publication M653, roll 262. 1860 U.S. Census, Lawrence County, Indiana, population schedule, Spice Valley township, P.O. Bryantsville, p. 149 (penned), dwelling 1910, family 1910, Wm McNabb; NARA microfilm publication M653, roll 276. 1870 U.S. Census, Greene County, Indiana, population schedule, Centre township, P.O. Solsberry, dwelling 21, family 21, Martha Lawhead; NARA microfilm publication M593, roll 318. This entry was posted in Sunday's Obituary and tagged Belle Lawhead, Casan Lawhead, Cassandria (Harden) Lawhead, Cora Perkins Lawhead, Crawford County, Emma (Lawhead) Foster, genealogy, Greene County, Guernsey County, Hutsonville, James Francis Lawhead, James Henry Lawhead, Jasper Lawhead, Joseph Lawhead, Margaret A. (Lawhead) Cox, Margaret Allie (Rea) Lawhead, Martha (Lafoon) Burch Lawhead, Minerva (Lawhead) (Riggs) Metcalf, Ortha E. Burch, Parey Lawhead, Paris Burch, Peach Orchard, Rev. W. H. Duncan, Robinson, Ruth Burch, Saphrone Lawhead, Sunday's Obituary on November 24, 2013 by Deborah Sweeney.